Defensa Street and 251, Everything along Defensa Street, in-between the Alsina and Moreno Street, from the Saint Francis Church, the City Museum, the old Pharmacy on the corner and a great place to eat “asados”, our Barbeques….. And last but not least, the Building at Defensa 251 where we have apartments to Rent. For more information on the Buenos Aires Toy Museum email: Email: admin@frassinetti.com Bob Frassinetti. Contact me by phone Skype, ID: Bob Frassinetti or you can also chat with me thru Yahoo, press here: Yahoo Contact Find me on MySpace and be my friend! 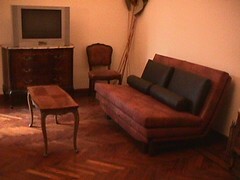 Apartment on Defensa Street in the heart of Buenos Aires Living, working and investing in the South of South America. Argentina, Chile and Uruguay …….